A giftbox with a gorgeous .925 silver bracelet with a symbol of Ininity: the symbol of infinite love and infinite friendship. For now and forever! Luxury finished with 13 sparkling CZ stones. Luxury wrapped, as ready for gift giving. For a big sister, a little sister. Carry along this .925 silver bracelets that symbolize your band. Luxury finished with 13 glittering zirconia stones and beautifully packaged in a gift box. By-and-by sterling silver. The love between grandmother and granddaughter mom is forever. Show it by wearing it together this infinity bracelets. Sterling silver. Gorgeous .925 silver bracelets for granddaughter, mom and grandma. To confirm your band ... to infinity and beyond! Luxury finished with 13 sparkling CZ stones. By-and-by sterling silver, forever beautiful. 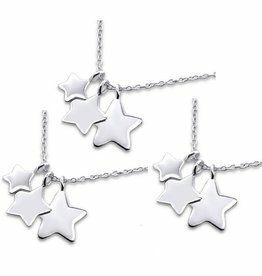 Symbolic set for mother & daughter: Three stars say 'I love you ... to the moon and back. " Through-and-through 925 silver. Each piece wrapped in a silk pouch, equally ready to give away. Symbolic set for three generations. The two intertwined hearts are saying 'we're always connected to each other. " Each piece wrapped in a silk pouch, even ready for gift giving. The love between a mother and her daughter is forever! This is shown by the ceremonial pieces of ivory beads, Swarovski crystals, rings and two text charms. You can choose the text and model bracelet.